“It’s done in the dark,” said Fatuma Ahmed, squatting inside her makeshift stick shelter. Prolonged drought in northern Kenya has pushed many families, like widow Ahmed and her seven children, towards the outskirts of towns where they are more likely to get food and water. Aid is in short supply and people are resorting to desperate strategies. It’s illegal to marry under the age of 18 in Kenya — so the phenomenon of “drought brides” is only whispered about, Reuters reports. Child marriage is not unusual is this part of the world. Many pastoralist communities, like Somalis in Habaswein, believe it is important to marry their girls off when they are young so that their honour, or virginity, is preserved. Women who do not marry young are seen as flawed and a burden on their family. Among pastoralist communities, a “dowry,” in this case a bride price, is traditionally given to the bride’s family in the form of livestock. “People marry when they have a dowry to pay and everything is in plenty,” said Abdi Issak, a local aid worker. 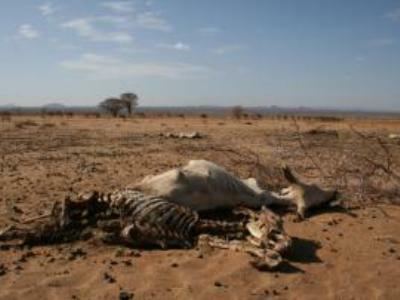 But most of the animals have died due to the drought that has affected around 10 million people in the Horn of Africa. The animals’ carcasses litter the desert landscape. Now young girls are being sold, according to locals, for as little as 15,000 Kenyan shillings (102.76 pounds). “If he’s wealthy, it can go up to 50,000 (341.96 pounds),” said Ahmed. Enrolment in his local primary school has dropped to 210 children from 350 since the drought started to bite last year. “Over a hundred have been removed because of hunger,” he said. According to the United Nations, only one in five girls in North Eastern Province attend school. Aid agency World Vision is unable to trace 400 of the 3,060 children it sponsors in the district. Some have been sent to stay with better-off relatives who can feed them. Some are working as maids in people’s houses or in food kiosks. But others are married off “just to make sure that the rest of the family does not die from lack of food,” said Jacob Alemu, World Vision’s local programme manager.